This month we will be seeing the Full Pink Moon overhead. Although the full moon will peak at 7:12 am April 19th (Eastern Daylight Time) it’s advised by the Old Farmer’s Almanac to view it on the night of the 18th for the best viewing. Don’t be disappointed if the moon doesn’t actually appear pink. In fact, each full moon’s name has more to do with nature than the appearance of its color. Each month typically has one full moon. About every 19 years February can see no full moon. Every full moon has a unique name and according to in the Old Farmer’s Almanac, these names were given to each full moon by Native American. However, it seems that the Full Moon names we use today also have Anglo-Saxon and Germanic roots. The moon has energy. The relationship between the sun, moon, and Earth cause natural occurrences, emotional and physiological events. We asked WU World-Changer and Intuitive Guide, Mitchell Osborn, to share with us the significance this Full Pink Moon plays in our life. “When a Full Moon occurs, it’s believed to be a great time to release the things in your life that are no longer serving you. Often rituals are performed in order to do this. It can be as simple as setting an intention to let go of that which is no longer serving you for your highest good and greatest growth. 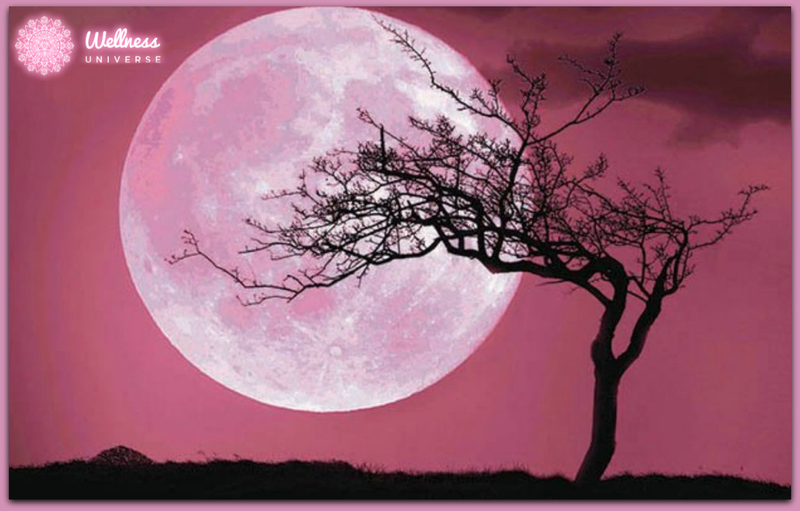 So, prepare for the April 2019 Full Pink Moon! Think about how you wish to change your life and prepare to dedicate a little time to self-healing by releasing what no longer serves you. Allow room to call into your life what you wish to manifest. In fact, releasing and letting go was a theme of SoulTreat Spring 2019. As members of The Wellness Universe attended a sacred Native American Fire Ceremony in Sedona, Arizona, they released into the fire what they wanted to let go of and called in what they desired. You can perform a similar ceremony in the comfort of your own home as you honor your highest self. Here is a modified version of the ancient Native American ceremony. It’s a simple way to release what no longer serves you and you can do this any time you feel burdened or during the times of higher spiritual vibrations or energies in the air. Light a white candle is a safe space. You will be burning paper in it, so be aware of the candle accommodating burning paper and take precautions while using fire. Tealights are not recommended. Sit quietly and comfortably with a notebook and pen handy. Breathe. Enter into a meditative state. Connect to that deep part of you where your truth lives. Once you are there with your thoughts, ask yourself out loud “What no longer serves me, in this moment, that keeps me from experiencing _______________ (love, abundance, financial freedom, joy, etc. )” See what answers come up. Write down your answers on a piece of paper. You will be ‘releasing’ what you write down. Don’t worry if tears flow as you perform this. Tears are a good thing! It’s part of releasing. Take a moment to process and breathe. Repeat step one, but this time ask yourself: “What serves my highest self in this moment to experience my best life.” Feel your answers to what you really need and what your soul desires. Then say, “Please allow ____________ (forgiveness, confidence, trust, love, money, health, etc.) to enter with ease.” Write down those answers on another piece of paper. These answers are uniquely your own. Take the first paper and read out loud what you wish to release. As you focus on letting go of what you have written, fold the paper up and put it in the flame. You can rip it into smaller pieces first if needed. Inhale and exhale a cleansing breath. Repeat with the second sheet of paper, setting the intention to call into your life what will serve you. Use the moon’s energy to help you to take a mindful moment and do a little self-love ritual is always healing. As we usually have one full moon per month, it should be used as a reminder to honor ourselves in a very special way.